A Kurdish man decorates a car with a poster bearing the image of Iraq's Kurdistan region's President Massoud Barzani, urging people to vote in the September 25th independence referendum, in Erbil, Iraq September 5, 2017. ANKARA - Ankara welcomed an Iraqi parliament move to reject a referendum on Kurdish independence and warned the semi-autonomous Kurdish region that insisting on the plebiscite would have a cost, the Turkish Foreign Ministry said on Thursday. The parliament in Baghdad authorized the prime minister on Tuesday to “take all measures” to preserve Iraq’s unity in response to the move to hold a referendum on Sept. 25. 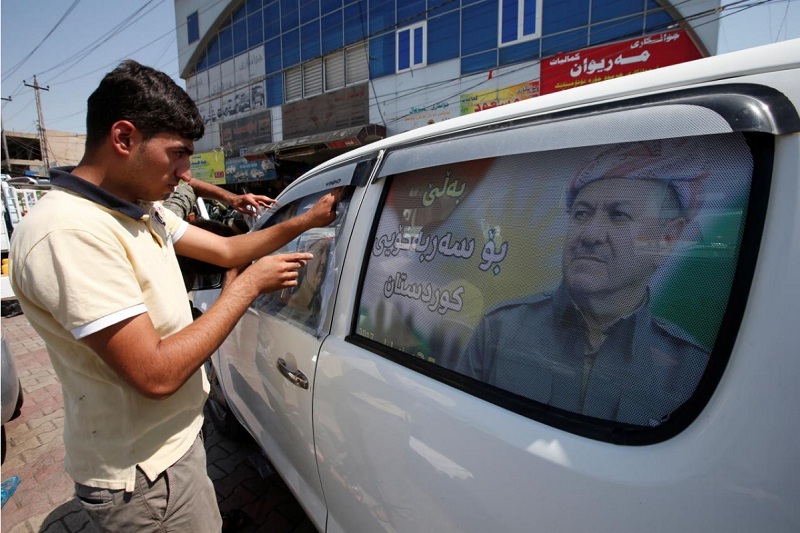 Kurdish leader Massoud Barzani subsequently vowed to press ahead with the vote, calling it “a natural right”. “We find the (Iraqi Kurdish) leadership’s insistent stance regarding the referendum and its increasingly emotional statements worrying,” Turkey’s foreign ministry said in a written statement. Turkey, which has the region’s largest Kurdish population, fears a ‘Yes’ vote could fuel separatism in its southeast where Kurdish militants have waged an insurgency for three decades in which more than 40,000 people have been killed. Last month, the head of Turkey’s nationalist opposition said the referendum should be viewed by Ankara as a reason for war “if necessary”. However, the Turkish prime minister dismissed his warning. Ankara has built solid ties with Barzani’s administration, founded on strong economic and energy links as well as Ankara and Erbil’s shared suspicions of other Kurdish groups and Iraq’s central government. Iran and Syria, also Iraq’s other neighbors, oppose the vote too, fearing it could fan separatism among their own Kurdish populations.